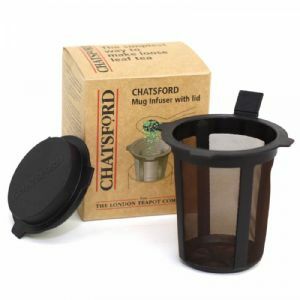 This mug infuser is one of the best ways to infuse loose leaf tea. It allows the tea leaves to fully expand. It's great for reusing leaves. The fine mess won't allow leaves to seep out into the cup. The lid keeps tea warm while it's infusing and flips over to make a stand to look after your leaves for reinfusing. It can be used in any size cup. It can go in the dishwasher.